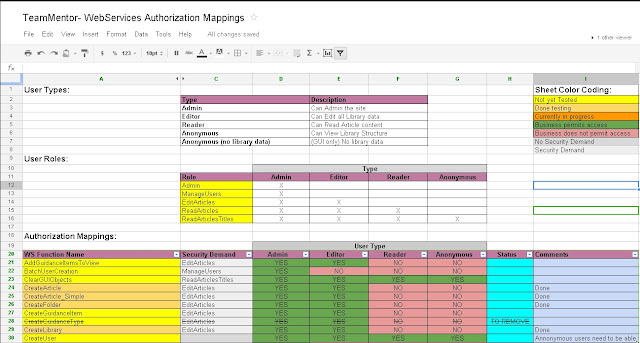 Dinis Cruz Blog: Is there a spreadsheet/template for Mapping WebServices Authorization Rules? Is there a spreadsheet/template for Mapping WebServices Authorization Rules? I'm looking for a spreadsheet/template that allows the business-rules (i.e. 'who has access to what') to be mapped, visualized and analyzed. In the past I have created a couple of these (some even with O2 Automation), but NDAs prevented me from sharing. So today, since I'm helping Arvind to create a set of Python scripts to test TeamMentor's WebServices, I took the time to create a model which I think came out quite well. Since I'm going to integrate this with O2 next, it is better to change it into a better format/standard now (vs later). I also think that we should have a couple of these templates in an easy to consume format on the OWASP WIki (I have lost count the amount of times that I have tried to explain the need for 'such authorization tables/mappings' without having good examples at hand). Note that creating these mappings is just one part of the puzzle! Also as important is the ability to keep it well maintained, up-to-date and relevant.